Mark DeDomenico knows the details of the diet that will allow him to reach his fitness goals. It’s the doing that’s that hard part. More than a decade of training, and weightlifter friends have given him concrete goals. “I know how you’re supposed to eat, your protein levels and your carbs and all that kind of stuff, eat five times a day and all that,” said DeDomenico, who is 62, and an owner of Cohen’s Bakery. “Food is really key to getting into shape, and staying in shape,” he said. “You really should be prepping your food ahead.” When he’s on, there’s 10 containers in the refrigerator with healthy, balanced meals. That’s where the meal prep service comes in. Like a growing number of people, DeDomenico has started buying meals from a food service business that combines a dieter’s rigor for portion control with the convenience of a drive-through restaurant. Meal prep businesses do what calorie-conscious people would do if they had the time and willingness to shop, cook, and clean up afterward. For $5 to $8 per meal, meal prep services offer non-processed food that meets the requirements of dieters willing to pay for convenience of filling their refrigerator for the week. Most of them even deliver. Jarrett Coppin, a scientist in his 30s, has been getting about 95 percent of his weekly meals from Eat Rite. Coppin is in training, with some weightlifting marks he’d like to hit, but is more focused on overall fitness. He’s tried several services, and has stuck with Eat Rite for its “ease of ordering, pick up, bulk pricing and tracking,” he said. Like most local meal prep offerings, each Eat Rite meal bears a label describing the amount of carbohydrate, fat, and protein included. “What makes it worth it, is time savings,” Coppin said. 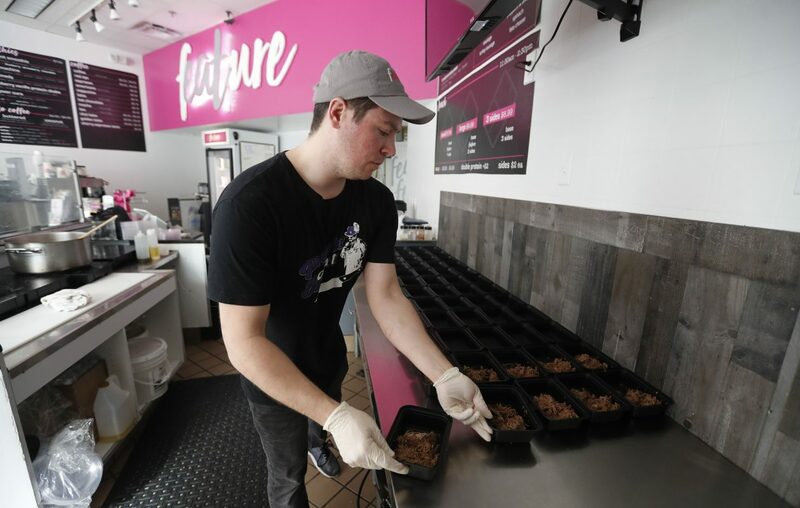 At Feature Meals, the restaurant and meal prep service that opened in downtown Buffalo in 2018, co-owner Michael Khoury said that it’s growth season for meal prep. Most meal prep places have meals ready to go, but Feature Meals restaurant setup allows customers to pick individual meals made in the moment. It’s a hit with people like Steve Karosik, 32, a graphic designer who works downtown. In the end, he’s drawn back, for convenience, and for the service that makes up for weaknesses. Address: 4685 Transit Road, Clarence, 1375 Hertel Ave. Addresses: 2488 Grand Island Blvd., Grand Island; 3525 Seneca St., West Seneca; 4125 Transit Road, Clarence; 2674 Delaware Ave.; 141 Buffalo St., Hamburg; and 5730 S. Transit Road, Lockport. Address: 5 Lake St., Hamburg; Southgate Plaza, 950 Union Road, West Seneca; 735 Delaware Road, Tonawanda.